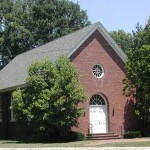 New Union Christian Church in Woodford County KY welcomes all! "Camp Sunflower: A Place to be You.. 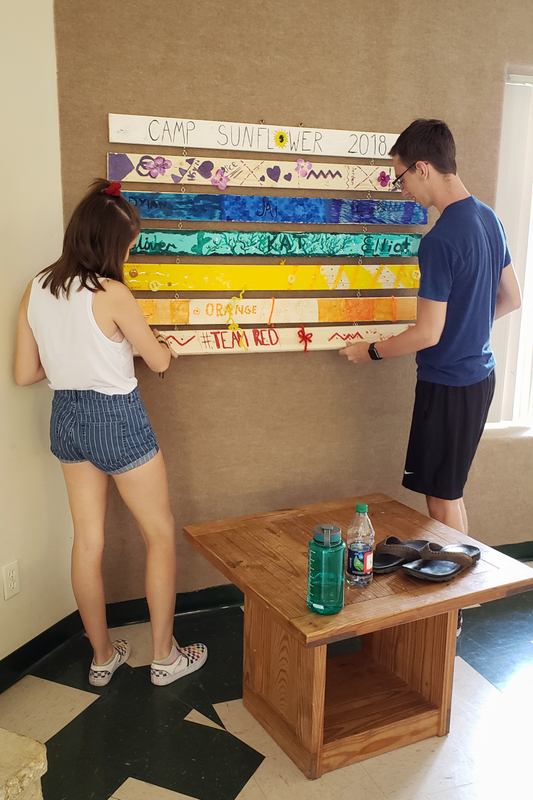 Inside and Out"
Cheryl and Dave Roy are two members of the group which began planning for Camp Sunflower for LGBTQ High School Age Youth in March 2017. A Steering Committee Board was formed in the summer of 2017. Dave and Cheryl currently serve on the Board of Directors for Camp Sunflower. 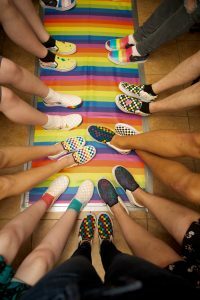 Campers, and camper’s feet, at Camp Sunflower 2018. July 20-22, 2018 was our pilot camp which was the first time for Camp Sunflower. It was limited to 10 campers. The campers at the beginning were very timid and stood against a wall by themselves where they waiting for the Party Bus to take them, the Director and rest of the staff to the camp. Once the pizza arrived and they began to eat they became a little more curious about each other. By the time the Party Bus arrived they were becoming friendlier and once they got to camp the campers were beginning to become friends. When they saw where they were staying at Camp Tawakoni they could instantly feel the most important thing, a sense of SAFETY. 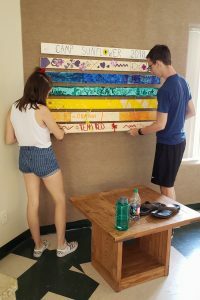 The camp activities were developed around the four principles SAFETY, CONNECTION, SELF-KNOWLEDGE and learning about skills in LEADERSHIP, and by the time camp was over the campers were best friends. “This year’s camp is June 9-13, 2019. We have kept the same four principles in developing the camp activities: SAFETY, CONNECTION, SELF-KNOWLEDGE and LEADERSHIP. We have begun taking registrations. Most so far are returning campers. This year we hope to have 30 campers. Our director, Finn, is returning from last year. He has years of experience directing LGBTQ camps. Since he is a native of Wichita he was really excited to see the first camp for LGBTQ high school youth in Kansas and wanted to be the Director. We know he and our co-director Shag come well qualified. You can read this report from the National Benevolent Association about last year’s Camp Sunflower experience. You can learn more about Camp Sunflower and register here, and you can email sunflowerks@gmail.com for more information. Previous PostQueer Community GatheringsNext PostHow is AllianceQ Funded?